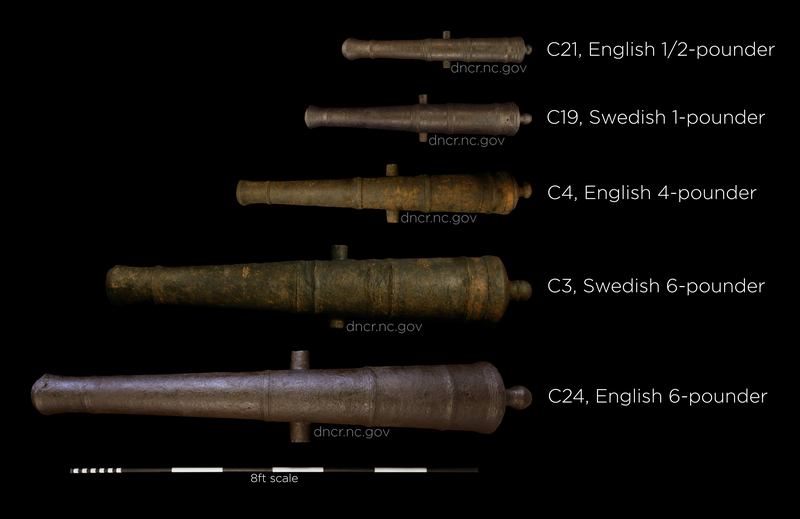 As of November 2015, a total of 30 cannons have been identified on the Queen Anne’s Revenge shipwreck site (including a bronze signal gun). Of the 24 currently recovered, 8 have completed conservation and are on display in various museums throughout the state of North Carolina. Sizes range from ½- to 6-pounder, indicating the size of the cannon ball the cannon fires. Once concretion is removed from the surface of a cannon, details such as the placement of reinforcement rings, stamps, and engravings give clues about when and in what country the cannon was made. So far, cannons on Queen Anne’s Revenge come from England and Sweden, they range in date from approximately 1640 to 1714, and at least 9 of them were found loaded!